COMPANY PROFILE Sprint Corp is a communications company offering wireless and wireline communications products and services. It offers products and services to individual consumers, businesses, government subscribers and resellers. Sprint is the fourth-largest carrier in the United States, serving 44 million connections directly and 16 million via wholesale. About 6% of sales come from the wireline unit, which provides fixed-line phone and data services, including services provided to the wireless unit. The firm acquired Clearwire, a troubled firm with a large spectrum portfolio, in 2013. Shortly thereafter, Japanese telecom Softbank took a 78% stake in Sprint through the purchase of existing Sprint shares and a $5 billion equity infusion; it has since increased its stake to 83%. The Piotroski Score measures the operational efficiency of a company. It is a well-rounded indicator that measures profitability, quality of earnings, financial condition and operating efficiency. Research has show that companies with high Piotroski scores outperform those with low scores. 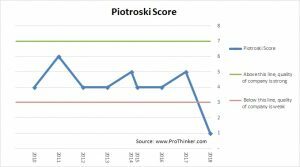 Piotroski scores range from a low of zero to a high of nine based on whether the company passes or fails certain criteria. Return on Asset measures a company’s ability to generate profits from the use of its assets. Cash Flow Return on Assets goes one step further to ensure that it is not just paper profits but cash flow that the company is generating. Current Ratio is a measure of a company’s liquidity position and determines whether it has sufficient liquid assets to meet short-term liabilities. The number of shares is compared with the previous year as a company that is not generating healthy cash flow may end up raising new equity and this is indicative of the health of the company. Gross Profit Margin is a measure of whether the company is selling its products/services at a high enough margin to cover its operating expenses. Asset Turnover is a measure of how well a company uses its assets to generate sales. 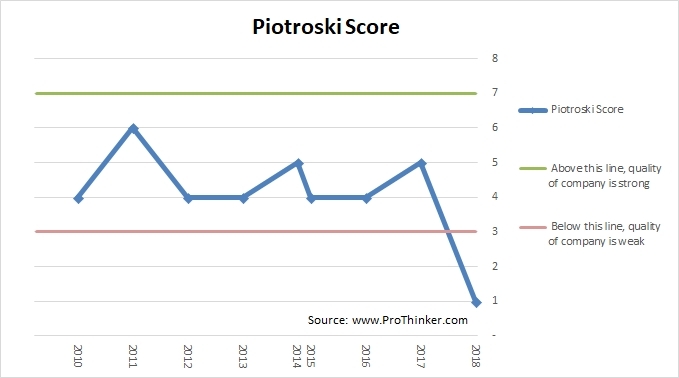 Determining the operational efficiency of a company is important as companies with high Piotroski scores tend to outperform the ones with lower scores. However, one needs to guard against paying too much for quality companies. A good company is not necessarily a good investment if the price is not right. In order to determine the fair valuation of the stock, we need to use multiple valuation indicators. The five ratios we use are Price to Earnings, Price to Sales, Price to Cash Flow, Price to Book and Dividend Yield. We use multiple methods to value a stock because each has its benefits as well as shortcomings. Price to Earnings and Price to Cash Flow Ratios relate stock price to profitability but are meaningless when the comany has negative earnings or cash flows. Price to Sales Ratio is more stable because sales are never negative. However, this does not tell us whether the company is able to sell profitably. Price to Book Ratio gives us an indication as to how much we are paying for the company’s assets but it is not directly related to the company’s profitability. Dividend Yield cannot be used for companies that are paying little to no dividends.